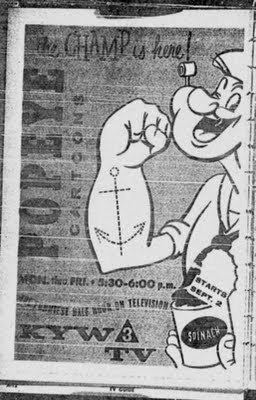 One of the first TV Guide ads for the Popeye Show on KYW-TV 3, to premiere September 2, 1957.. 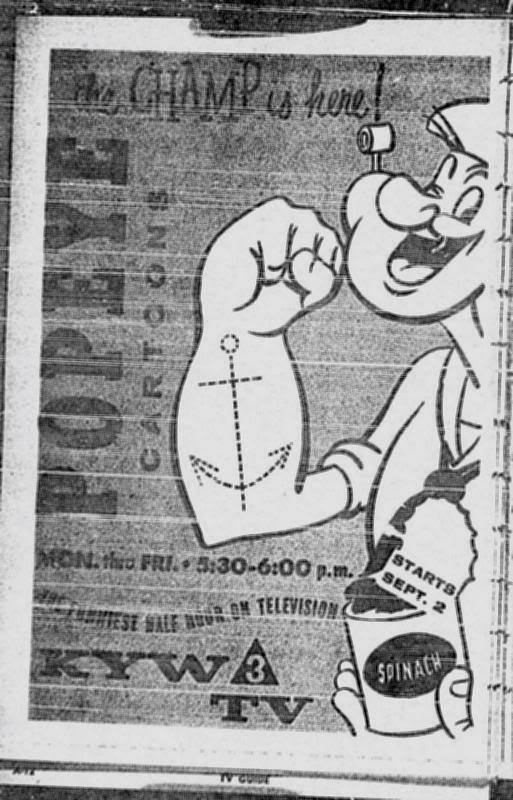 The above article is from the Cleveland Plain Dealer November 16, 1957. TV Writer Tom O' Connell Interviews Linn Sheldon, two months after the premiere of "The Barnaby Show"..The show has become a breakout success, even beating the Mickey Mouse Club on Channel 5 by a margin of 3 to 1 in the ratings..One could argue that no one else locally had that kind of fast success until Ernie Anderson's "Ghoulardi" came along in January 1963 on WJW-TV 8..Sheldon seems amazed that after being on Cleveland TV for 9 years, that Barnaby/Popeye has been so successful, so fast..
Sheldon, of course, continued with Barnaby for most of the next 33 years, playing the character on channel 43 from 1969-90. 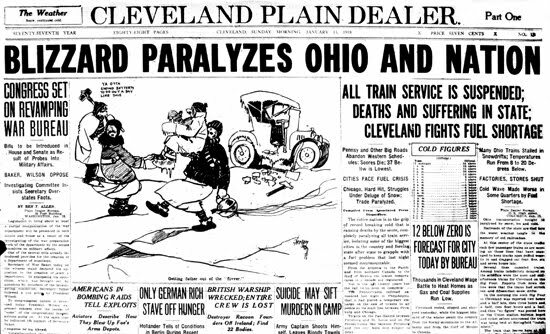 Front Page of Cleveland Plain Dealer January 12, 1918..Notice the masthead:CLEVELAND Plain Dealer, rather than just "Plain Dealer" since the 1960's. Source:ohiohistory.org..
A number of times, I've mentioned where I get much of the material for the blogs and the Facebook Page, I won't go into that again, but I do want to announce an exciting development.. I made a daylong trip to Cleveland last Monday, May 16..I probably take these trips 3-4 times a year to visit landmarks, take in a sporting event, but mostly to do research at the Cleveland Public Library..Made a stop at the Library once again..This time, after a bit of research, I decided to try something new.. I'd been made aware of a digitized Cleveland Plain Dealer Archive, which consists of a vast majority of the Complete Plain Dealer Newspapers from 1845-1991..In years past, I'd been denied a Cleveland Library card because of not living in Cuyahoga County..They changed their policy, apparently as I signed up for a Library card Monday with no problem. With Modern Libraries, a Card opens a lot of doors to research databases, Newspapers, Magazines, downloadable audio and video, etc..from Home Computers as well as inside the Library..The Plain Dealer Vintage Archive is one of the databases that can be accessed from Home Computers. 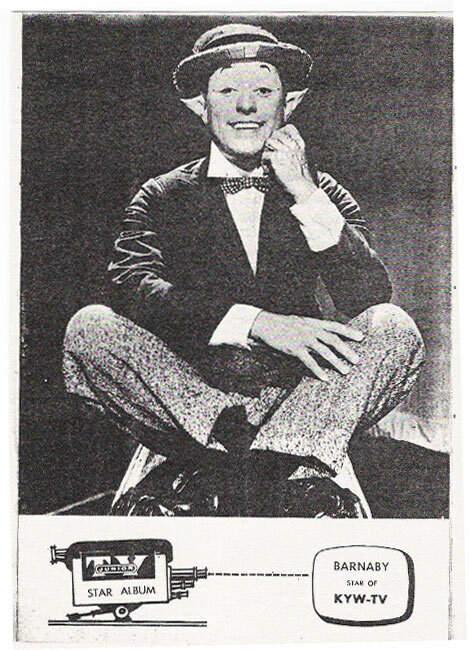 What this means is that I now have a fullly accessible history of Broadcasting in Cleveland from 1922-91, including the entire History of Cleveland/Northeast Ohio Television up to 1991..I've already on the Facebook Page shared The Premiere of Pete Franklin's Sportsline in Cleveland on WERE and Captain Penny's 10th Anniversary on TV 5..This is an outstanding development for the blog and I hope to take full advantange of this opportunity. My heartfelt thanks to Cleveland Public Library for their assistance in allowing this to happen.. Here we have a real rarity..Play By Play of the late Jimmy Dudley..Dudley was with the Cleveland Indians mostly on radio from 1948-67..He was fired from the Indians after the 1967 season..It was said he and partner Bob Neal didnt get along..
Seattle was awarded an American League Franchise for the 1969 season..Owned by Dewey Soriano and Former Indian owner Bill Daley, it was a disaster from the start..Playing in an antiquated ballpark(Sicks Stadium), the team was rushed into play due to factors beyond their control..One bright spot was the Broadcast team of Jimmy Dudley and Bill Schonely on KVI-570. Here are 3 rare clips from March 28, 1970..The next to last game for the Seattle Franchise. Schonely was later known as the primary Broadcaster for the Portland Trail Blazers of the NBA. Mike Hegan, current Indian Broadcaster, had just bought a home in the Seattle area, but with the pending Milwaukee move, that was now up in the air..
Ted Kubiak, now Indian minor league manager at Class A Lake County, turned a double play with Gus Gil, for the last 2 outs of the game..
Roy Foster, mentioned in the Mike Hegan Clip, played 1970-72 with the Indians, afer 2 decent power seasons, his numbers dropped off a lot by 1972 and he was out of Major League Baseball by the end of the season. A great Historical site detailing the Pilots History.. While I love baseball, and part of that interest is reading about teams that move from one city to another or disband, the main attraction here is hearing extended work of Jimmy Dudley, arguably one of the better Tribe announcers of all time..